Jillian Riley, otherwise known as A Mom with a Lesson Plan, is the mother of two and a former preschool teacher. I love her blog tagline, which is “add a little learning to your playtime.” Here she shares some ideas and tips with us on ways to encourage creativity in our children. Jillian’s new e-book, Raising a Creative Kid: Simple Strategies for Igniting and Nurturing that Creative Spark, is filled with easy-to-use information that parents can implement everyday. While she included a chapter on arts and crafts, she focuses on showing parents how we can encourage creativity in our children in many different ways such as buying open-ended toys, playing creative games, the language we use, and appreciating mistakes. Painting the egg cartons was my idea… the party blower/ egg carton game was Big M’s idea. JEAN: I enjoyed reading your e-book, Raising a Creative Kid, and especially like that you look beyond arts and crafts when discussing creativity. How do you define creativity? JILLIAN: Creativity means having the confidence that you will be able to find an answer, whatever the situation might be. While using creativity can be fun, relaxing, and profitable, I think the bottom line is that being creative makes you a problem solver. JEAN: What is your best bit of advice for parents who want to encourage their children’s creativity, yet don’t consider themselves creative (and who may feel hampered by their own self image)? JILLIAN: Oh, I love this question. It really cuts to the heart of Raising a Creative Kid. Creativity can be overwhelming if you think in terms of what is difficult for you. I am not an artist, and if I tried to find creativity in my drawing I would surely be frustrated and defeated. The great thing about creativity, though, is that it looks different in every person. You might be creative with numbers, creative with ideas, creative with social situations. Finding places where you are already creative and focusing on those will help grow your confidence, nurturing your creative spirit. Imagine how much learning your kids will absorb by being a part of your creative process! JEAN: What are your children’s favorite creative outlets? What really engages them and get’s them to them to think and create “outside of the box”? JILLIAN: Big M creates all the time. This morning he dragged an old rain gutter, two large orange cones and a bucket full of wiffle golf balls over to the slide. I watched as he placed the cones on either end of the rain gutter and propped one cone up on the bottom of the slide. He spent the rest of the morning dropping balls down the slide, into the cone, through the rain gutter, out the other cone. The pride on his face as he watched his idea come to life was exactly what drives me to provide them with a creativity rich environment. Little M loves to sing. She makes up songs while she is playing or working. One of my favorite things is to sit close to her while she plays and listen to her stories unfold. Little M prefers open ended toys that revolve around pretend play, but every once in a while she gets creative with Legos. JILLIAN: That’s easy. Legos, dress-up clothes and wooden blocks. Those are the three toys that are constantly being used. Big M pretending to build a sand castle at our indoor beach. Little M love to make fun mixtures. Here she used dirt, water, leaves and (eww) slugs. JEAN: How do you feel your past experience as a preschool teacher and co-owner has affected how you parent? JILLIAN: Early childhood training and experience has given me an extensive tool bag to grab from and the confidence to grow with my kids. I sometimes joke that every parent would benefit from an Early Childhood Degree. Really though, we are lucky to live in an age where finding easy, doable answers is just a click away. JEAN: And, the flip side of that question is, how has being a parent affected how you view teaching? JILLIAN: Having the opportunity to watch M and M learn in their everyday lives has increased my passion for playful learning. I see that they learn so much faster and soak up so much more when they are in charge of the course their learning takes. Now that they are entering school I am working hard to keep learning about life, not just something you do at school. JEAN: Thanks so much, Jillian! For more about Jillian and her blog, visit A Mom with a Lesson Plan. She has a lot of great ideas for making learning fun. My favorite? Her post about using kid-made storytelling cards (yes, I pinned it). Sounds like a fantastic e-book. Fingers crossed and thanks for sharing. Another great interview Jean, thanks to both of you. I couldn’t agree more about creativity not just being art related – goes back to that whole conversation we had here on your blog! This sounds like a great read, right in line with my interests. I’ll have to check it out. Would love to read this as I have a very crafty girl and limited ideas about how to keep her creative. Thanks for this post. Very interesting. Would really enjoy reading the book. I would love to read this book. It sounds right up my alley! Thanks for sharing this interview. This is something I am trying to do with my son! This is an area I am suddenly struggling with with my 4 year old. I would love a chance to read this book. Thank you for the interview! A great introduction to a book I’d love to read. Thanks for a great post! I’d love to read this book! Would like to get some ideas from this book to use with my soon to be 4 year old. Love this! Especially the bit about how being creative is more than just the arts. My little one actually does love art and I love sewing and general crafting but I have heard before from others how they wish they could be creative as well. And generally from folks who already already are creative. They just don’t recognize their own creativity. And I love the term “Playful Learning,” I even have a whole board on my personal Pinterest titled that exact phrase. It just captures perfectly exactly what children (and adults too if they let themselves) get from playing. :D Excellent interview. Thank you! Thanks to both of you — love the emphasis on the many different ways to be creative, and the ability to develop problem solving skills! I totally want to make a slide project like the one in the picture! Thanks for the giveaway–sounds like a wonderful book and a wonderful family. Great interview! I hopped right on over to check out her blog. Love it! This sounds like a great book. Thanks for introducing me to it! Sounds great! I would love a copy. Very interesting and I would love to read it. Thank you for the opportunity. Always appreciative of having such talented parents sharing their ideas so the rest of us can benefit. Loving the resources here and will look forward to coming acquainted with JIllian Riley’s blog and book. Learning about this book is a perfectly timed gift. Thank you! I will do anything to instill the creative spirit in my child. Looks like an awesome book! I love painting with my 2 year old, and I’m obsessed with loose parts and open ended toys. Sounds like a fun and creative book. What a wonderful giveaway. What a great sounding book. I love simple activities and toys that my boys’ imagination reign. This looks like a fantastic resource for me and my wife to use with our two boys. Thank you for bringing it to my attention. Awesome! I’ll get it either way! Its refreshing to here that legos, blocks and dress-up are the three best toys to nurture creative play. I couldn’t agree more, that’s my 5 year old does :) My favorite parent and kid play is blocks. I would love to win this book – I could use it at home with my boys and in my classroom with my students. I struggle with this, so I’d love to win! I adore the idea of being creative at home because now a days in schools, kids really miss out on the oppurtunity. I believe that it is our job as parents to fill in where our school system is failing our children. Taking an active part in our childrens creativity, education and physical activity is key to raising successful children for everyones future. I would love to win the book, but if not I will go buy it. Sounds like a really interesting book, I love that the idea of creativity is so open-ended and ‘solution finding’, not just arts and crafts (though I do love arts and crafts, too!). This looks like a great book. Thanks! I always need more ideas for creatively engaging my kids! Thanks for introducing me to this book. It looks great! Thank you for promoting this – play and creativity are so very important to foster. The jobs/careers/education/world of tomorrow will need creative thinkers! I would love to read this book! We create stories and act them out a lot at our house. I applaud her definition of creativity! Thanks for the chance to win that fantastic book! Looks awesome and I would love a copy! This book looks great. Hope I win! I love how creativity is really linked to problem solving, not to being “artsy.” Great point! I’d love to read more! Both my son (8) and daughter (4) love being art and crafty. I worked from home yesterday and as its school holidays Will is home with me. He worked for hours making paper beads then stringing them together to make a bracelet for his little sister. He then found a box to put it in, wrapped it up and cellotaped it to the front door so she would see it when she came home from pre-school! I was feeling the love and I guess so was he! Thanks for this giveaway open to readers worldwide. They’re not easy to find. I’d love to read this book. Like Jillian, my experience as a mum has also influenced the way I teach at school (even though I work with teenagers). would really love this for my kids! This sounds wonderful! I’d love to have this book! This would be a great resource for teachers to share with parents too. Sounds great! Would love a copy! Sounds like a great book. As one of the questions above stated, I don’t feel like I have a creative bone in my body and would like any information on how I could help bring out the creative side of my child. Thanks for an interesting interview and the chance to win the book. Very interested in reading. I would love such a book, my grab bag could use some more ideas. 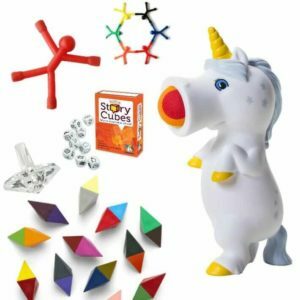 I homeschool my two boys to increase their creative play time available to them. but we are in need of some new ideas. thanks for this interview. I find that the games my daughter (17months) creates are often the activites that absorb her more. I am amazed at how creative she has been from an early age and this book sounds a great read to ensure I continue to support her creative processes. I love to own an e-copy of this book. As a preschool teacher, I am always seeking for opportunities to grow and learn from other experienced people. Thanks for telling us about this book. I checked out Jillian’s website with all the wonderful ideas. I’m sure her book is wonderful too. I would love to have this book, the title itself sounds great already! This looks great! I love the slide activity that’s shown! Thank you so much for this interview and the giveaway. I’m putting this book on my “career development” reading list. I’m a homeschool mother who is always on the look out for ways to make our learning more fun and getting more learning into our playtime! Thanks for sharing! Would love to win this book too! Would love to read the book! I appreciate that you considered Legos on of your top three. I didn’t enjoy them much as a kid and always sort of lumped them as a “plastic toy”, but then my oldest boy had a friend who loved them, we got some, and we’ve never looked back. They get hours and hours of playtime and are so great! When making a kit they are learning to follow directions, and getting ideas for their own creations, and when they are making their own stuff their imaginations run wild and it is so fun to watch! What an inspiring book! I’d love to read it! fingers crossed! it’d be lovely to win! Jean, thanks for the question about the three toys. Thankfully, we have all of those in our house, and yes, they get used the most! Would love to read this book! This post is so encouraging to me. Sometimes I don’t feel like I’m doing enough for them. I’m reminded though that as they play library, store, pirates, build cities with blocks for my little ponies, build high towers with legos and knocking them down etc. they are learning. Thank you so much. Play is so important. I would love to win this book. It sounds like an inspiring resource for creative ideas. It sounds like a great book! I would be so happy to read it! Thanx for this opportunity! It would be great to get a copy of this book. We are just really starting the creative phase of childhood. Wow, this is my dream. Creativity is so precious and need to be started from childhood. I am always looking for more ways to inspire creativity in my son! Very excited about this book! I have two girls and I would love more ideas on how to encourage their creativity! I’ve been following Jillian’s blog for a while, and have always been inspired. Really look forward to the book! Would love to have a copy so I can share it with others. Love the ideas you’re bringing forward. Thank you! Opening a new school where creativity abounds. This could be an excellent resource!